The Frederick has a pronounced firebox trim, bordered glass doors and rich finish options that add to the antique feel of this classic entertainment mantel. Capable of safely supporting a television of 100 pounds or less while adjustable shelving accommodates most electronics and other objects. The Vivid Flame Electric Firebox plugs into any standard outlet for convenient set up. Features include remote control, programmable thermostat, timer function, brightness settings and ultra bright Vivid Flame LED technology. Provides supplemental heating for up to 1000 square feet. 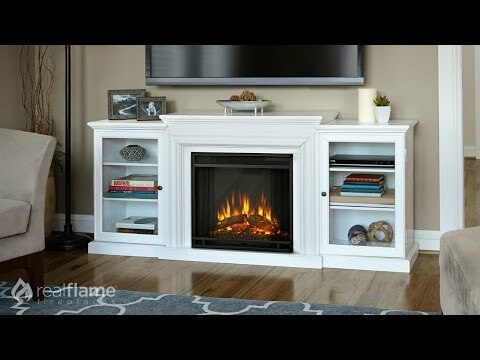 Real Flame Electric Fireboxes will keep you warm while providing truly realistic flames in your fireplace. Fireboxes come with 1400 or 1500 watt heaters, depending on the mantel you choose. The 1400 watt heater rates over 4700 BTUs, and the 1500 watt heater uses infrared heat to rate over 5100 BTUs. Both heaters will keep your room warm during the cold months. The programmable thermostat, remote control, and timer function make maintaining your desired temperature easy. We love that Real Flame’s Vivid Flame Technology provides ultra-bright flames through LED bulbs, with five different brightness settings to showcase your fireplace. The dynamic ember effect also helps add realism and clarity to the firebox. Another feature of this fireplace that we love it is that it produces no emissions or pollution, making the VividFlame Firebox EPA approved for maximum heating efficiency. This means that you can achieve much more heat with substantially less fuel. Real Flame Electric Fireboxes are available in several different style mantels, making it easy to incorporate this realistic firebox into your space. Whether you’re looking for a media console or traditional mantel, with a wood or color finish, Real Flame has a mantel that will complement your décor. Some assembly is required before using this firebox in a mantel. 24" 51 3/16" 40" 24"
1,000 Sq. Ft. 150 Sq. Ft. 1,000 Sq. Ft. 1,000 Sq. Ft.